The first point of departure is knowing yourself. Ask yourself questions such as, Do I want to live with objects that inspire me? That are decorative? Once you get a good understanding, it helps you focus. If you don't yet know which works speak to you - go out and see some art. 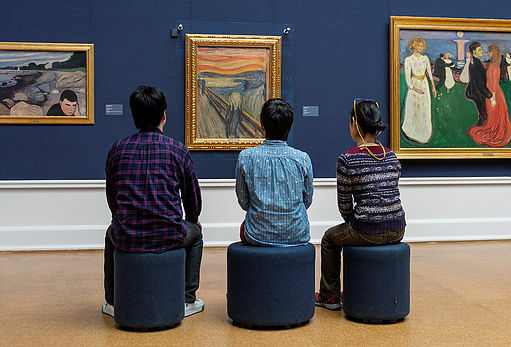 Visit cultural institutions, museums, galleries and art fairs in your community. Choose particular artists and galleries you like and follow them. The more time you put into it, the more you'll get out of it. The most important thing is to educate yourself first. Because collecting isn't something you can do alone, it is crucial that those helping you have your interests at heart. When you ask questions, make sure you are getting an honest answer. As you learn more about the arts, your tastes are going to change. That's a good thing. A collection should never be a static thing. The best collections are those that have constantly evolved and been upgraded over time.